Down with the imperialist attack against Syria! 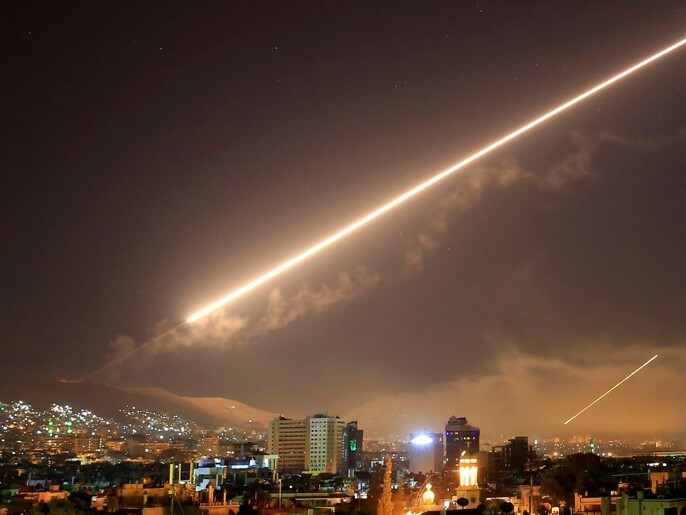 Yesterday night the USA-UK-France launched a coordinated airstrike in Syria, under the pretext of the unsubstantiated international campaign about use of chemical weapons in the Syrian town of Douma. Communist Parties condemn the organized media campaign and imperialist attack against Syria. The Syrian Communist Party (SCP) condemns the escalation of the brutal colonial aggression by false pretexts. The SCP asserts, "This aggression makes proof of the inability of the colonialists and their agents to overthrow our homeland." Claiming "this Zionist imperialist aggression will not dissuade our Syrian people," the SCP refers to the country's victories against Western colonizers in history and calls for another "Hattin victory" against the tyranny of imperialism and the crimes of its dark agents. The statement of the CC of the SCP ends with the following slogans: "Our cause is just and victory will be ours. Syria will not kneel!" See the link for full text in Arabic. The Communist Party of Turkey (TKP) describes the airstrike as an "irrational, illogical attack, that is against the most fundamental international rules." For this crime, the TKP charges "wicked and barbarous imperialists", "villainous exploitative classes" and the AKP government as well, who allowed İncirlik Air Base to be used. Calling for solidarity with the Syrian people, the TKP warns: "Fear the rage of the oppressed, the exploited and the toiling masses. They are fed up with your lies, fake images, provocations, disgusting interventions and conspiracies!Exploiting people, forcing people into imperialist wars, making them kill each other for the profit of your monopolies are outrageous crimes. You will definitely pay for these crimes." The Communist Party of Greece (KKE) points out the danger of a generalized imperialist war with unknown consequences for the peoples of the region, as well as for the peoples of all the world. Attributing a great responsibility to the SYRIZA-ANEL government, the KKE claims that it has "transformed our country in NATO safe heaven." It is reminded that NATO and the EU are factors of insecurity, destabilization and border change. The statement ends as follows: "Now is the time to reinforce our struggle against imperialist war, in order to close down the Souda military base and all foreign military bases in Greece, for the Greek troops to return from their missions abroad, for the disentanglement of our country from NATO and the EU. There is nothing to divide amongst the people. With our solidarity and common struggle let’s raise a wall against the plans of the imperialists, put in our cross-hair the rotten system that gives birth to poverty, crises, wars." The Party for Socialism and Liberation (PSL) in the United States, points to the probability of a much wider war to reverse the Syrian government’s gains and impending victory against the imperialist-funded terrorists. The PSL reveals the time-tested tactics of the media, which are to "demonize the leadership of the targeted entity and promote false and distorted materials to convince the public that the U.S. Empire is pursuing noble objectives while utilizing devastating violence." The PSL claims that there is no more critical issue for the U.S. socialist and progressive movement than to be able to respond decisively to U.S. imperialist war. The Communist Party of the Peoples of Spain (PCPE) declares that the risk of a generalized war gets much closer with the involvement and presence of various powers in the Syrian territory. It is asserted that the people of Syria have been suffering because of the powers that only want a fragmented and unstable Middle East to advance their geostrategic interests. Calling for a mobilization in defense of the people of Syria, the PCPE demands the government of Spain to publicly condemn this attack and to immediately cancel any agreement on the presence in Spanish territory of military and diplomatic forces of the coalition of attacking countries. The French Communist Party (PCF) criticizes the President Emmanuel Macron for convening the parliamentary discussion after the armed forces carried out their intervention. The PCF denies the transformation of Syria into a field of maneuver and partage for the great powers and declares its support for Antonio Guterres's proposition for an international conference within the framework of the United Nations. See the link for full text in French. The Revolutionary Communist Party of France (PCRF) calls for workers and public forces to oppose President Macron concerning the warmongering crimes that he carries out with "his friend" Donald Trump. The youth organization of the Pole of Communist Renaissance in France (PRCF) calls for the French youth to reject justifying or following warmongering deliriums against Russia. Against the threats of a generalized war provoked by Trump and Macron, the PRCF youth calls for the common mobilization of the forces of peace in France, Europe and the World. The Communist Party of Israel and the Democratic Front for Peace and Equality condemn the US strike assisted by Israel and remind of the US's rich history of aggression and bullying in the region. They call for a political solution in Syria - a solution that assures the independence and unity of Syria, and the Syrian people's right to democracy, equity and social justice. The Lebanese Communist Party condemns the US and Western threats and the decision of aggression against Syria and calls for a proactive communication and consultation with all national political forces. See the link for the new on ICP. The Communist Party of Bangladesh (CPB) states that imperialist wants to assassinate Bashar al-Assad and want a regime change in Syria since no international agencies were able to prove the allegation of using chemical weapons by the Syrian government. Expressing its solidarity with the people of Syria, the CPB demands that the government of Bangladesh issues a formal condemnation against this undoubtedly illegal attack. The Communist Party of the Russian Federation (KPRF) Central Committee Chairman Zyuganov Gennady Andreevich named the attack as a behaviour of 'a highway robber'. He expressed that Russia needs to "not succumb to provocations," while doing everything in order to strengthen air defense measures in Syria and also stressed that about 70 missiles on Saturday in Syria were shot down primarily Soviet weapons. The Communist Party of Britain (CPB) condemns reckless and illegal aggression in Syria. Britain's Communists question the use of British bases in the sovereign state of Cyprus, without the agreement of that country's own parliament and call on MP's and the members of the Scottish Parliament and Welsh National Assembly to condemn this aggression. Criticizing the rogue character of the world's three main imperialist powers, the CPB claims that Britain, the USA and France have bombed or invaded more countries since 1945 than the rest of the world put together. The CPB points out the urgent necessity to leave both components of the NATO-EU alliance and stresses the need for "a government of the left that will pursue an independent foreign policy for Britain." The Tudeh Party of Iran condemns the criminal imperialist intervention and considers it as an open and flagrant violation of international law and the United Nations Charter. The Party declares that the malicious and inhumane policies of the ruling powers in the United States, Britain and France have further aggravated the situation in the Middle East region, in a way which endangers global peace. The Tudeh Party calls upon all forces advocating for peace and progress to oppose neo-colonialist designs of the world imperialism and this new dangerous drive to war in the Middle East. The Palestinian Communist Party affirms that the tripartite aggression is the result of the great victories achieved by the Syrian Arab Army in combating terrorism and mercenaries associated with the West and the Zionists and expresses its absolute solidarity with Syria with its people, army and government in the face of this brutal aggression of the Western and American arrogance. The Communist Party of Luxembourg (KPL) asserts that there is no proof at all for the use of chemical weapons by the Syrian army, but that there are clear indications that the respective information had been staged by Western secret services and their local accomplice. Concluding that the current government of Luxembourg is not a government of peace and that it must not be re-elected at the forthcoming national elections, the KPL demands that the government should explicitly distance itself in the respective bodies of NATO, EU and UNO from all attacks violating the International law. The Communist Party of Ecuador defines the attack as a "provocative adventure" and invites all democratic, progressive and revolutionary organizations to express their rejection of imperialist practices against the countries of the world, whose sovereignty and total independence need to be respected. See the link for full text in Spanish. The Communist Party of Chile declares that this military aggression, ordered by President Trump behind his own Congress, violates the sovereignty of the Syrian Arab Republic, despises the role of the United Nations, exacerbates conflicts in the region and threatens world peace. The Party expresses its solidarity with the government and the people of Syria for the damage to their infrastructure and possible human losses. There are also collective statements issued by dozens of Communist Parties from all around the world. The Statement of the Communist and Workers Parties, initiated by Communist And Workers Parties of Europe calls upon the working class, the people’s forces to reinforce the struggle against the imperialist interventions and wars, of the NATO, the USA and the EU. It states that peoples must not shed their blood for the interests of the monopoly groups, the competition for the control of energy resources, the routes of transportation, the control of the markets and the distributions of spheres of influence. The statement emphasizes that peoples have the right to live peacefully and have the power to claim a society free from wars, crises, poverty and exploitation. See the link for full text in English, Russian, Spanish, Arabic, French and Albanian. The Statement on the Condemnation of the bombing of Syria, condemns the imperialist military aggression, considers that this unacceptable act of aggression is an integral part of the escalation of confrontation and wars of aggression by imperialism and calls for solidarity with the Syrian people. See the link for full text in English, French, Spanish and Portuguese.